Most online reservation systems offer the functionality of the “Post-Stay” email. This is the email that goes out to the guest after the scheduled date of the checkout thanking them for their business. Very often, this is an optional feature, meaning that the property may choose not to use it at all. The ones that do, use the standard, predefined text that the module comes with. Customize it. This email marks the first step towards guest retention. Set the right tone for future interaction. Don’t use cookie-cutter statements that people know you don’t mean. Talk about how your property tries to personalize its services to its guests, and what major improvements are in the works. Offer a channel for feedback. Give out the email address and phone numbers of the General Manager or the person in charge of guest relations and invite the guest to share their experience. Positive or negative, you WANT to hear what they have to say. It’s only going to help you along the way. If it’s a positive experience, good for you! Respond with an email requesting them to share their experience on TripAdvisor. If it’s a negative one, chances are that by providing a channel for them to vent, they wouldn’t feel compelled to rant on TripAdvisor or Google. People who feel validated are far less likely to post negative reviews. And even if they are, they’re more likely to be objective about the review. Either way, please make sure you respond to the guest via email or phone. If you care about guest satisfaction, this is “walking the talk”. Highlight current promotions. If you have a special running, why not put it there so the guest is aware of it for next time. Reward programs. Not all hotels have these, but if you do, you’d do well to encourage the guest to sign up for it. If they booked you via an OTA this time, they’ll probably want to book direct with you the next time. You could have just pushed your net revenue by 25% on the next booking. Track your emails. Email tracking systems are beautifully sophisticated these days. If your provider allows, review key metrics such as % of opens and click-throughs to your website. That info is solid gold. Use it as a tool for permission based marketing. This one is easy – invite the guest to join your mailing list. So there you have it. 6 uses for a little-used feature that all reservation systems provide. In most cases you’ll only have to put in the effort once. Totally worth it! I came across an example of a brilliant Post-Stay email and have to show this to you. Its from Shashank Nigam on Simplifying.com. 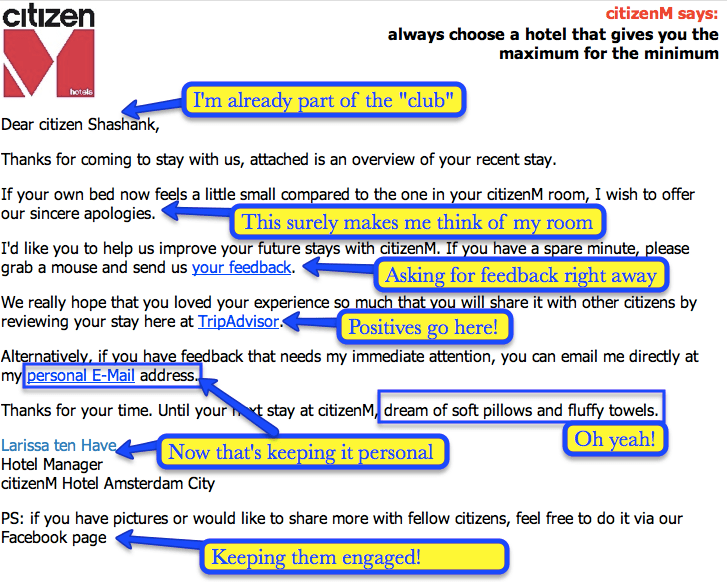 The Hotel that sent this was CitizenM in Amsterdam. If you’ve used this feature effectively in your organization, why not share your thoughts with others? Feel free to post your thoughts in the comments section below.